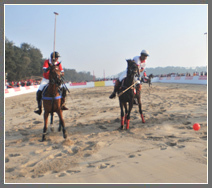 The first event of its kind in India took place on December 31, 2009 in the Lalit Suri Beach Exhibition Polo Goa hosted by Mrs. Jyotsna Suri, Chairperson & Managing Director of The Lalit Suri Hospitality Group. Marking the introduction of the sport of beach polo to a country steeped in polo history and traditions, the event attracted a host of well-known Indian players who took the field (beach) to pit their skills against one another in the spectacular setting of the InterContinental The Lalit Goa Resort’s Raj Baba Beach. Previously limited to such exotic venues as Miami, Dubai, Punta del Este, to name a few, beach polo’s debut in India was quite well received. Twenty highly trained polo ponies were brought in from Delhi for the 1pm exhibition match that attracted some of the country’s more notable players. In an effort to make the exhibition match as comfortable as possible for the spectators, noted polo commentator Pradeep (Bogey) Rao was on hand to report and comment on the action on the beach. The Exhibition Match was played between The Lalit Red Team (Jai Shergill, Navin Khanna and Angad Kalaan) and The Lalit White Team (Dr. Pawandeep S Kohli, Ransher Singh and Uday Kalaan). The thrilling match, which was umpired by Preetinder Singh, saw The Lalit White Team escape with a 5-4 victory. A sand game arena and a tiered viewing gallery were specially created for the event, much to the appreciation of a host of VIPs and onlookers.